The Velar, seen here in a teaser pic, will be slightly taller than the Evoque with a more rounded exterior design than Range Rover Sport. Land Rover confirmed Velar as the name for a new SUV that will be a rival to the Porsche Macan. The Velar will be the fourth member of the Range Rover family, Land Rover said. It will be positioned between the entry-level Range Rover Evoque and the more expensive Range Rover Sport. "We call the Velar the avant garde Range Rover. It brings a new dimension of glamour, modernity and elegance to the brand," Land Rover Chief Design Officer, Gerry McGovern, said in a statement on Wednesday. 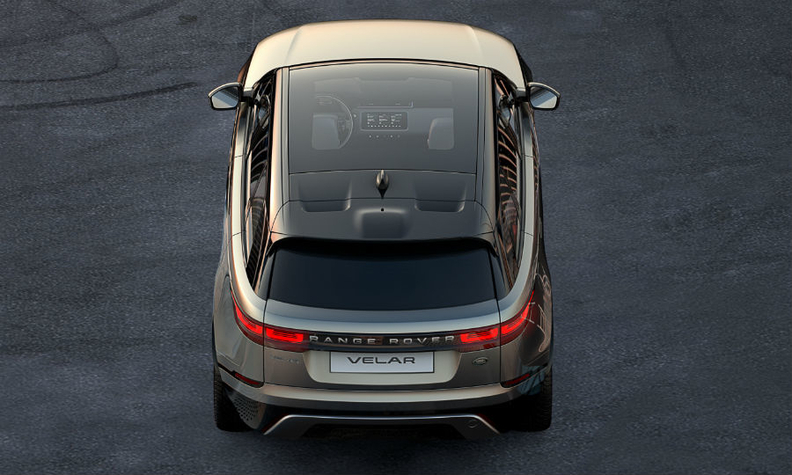 The Velar name dates back to the first Range Rover prototypes of the 1960s when development engineers chose the name Velar, derived from the Latin velare meaning to veil or cover, as a code-name for pre-production Range Rovers. The SUV will be built at Jaguar Land Rover's plant in Solihull, England. It will have "pioneering consumer technology" and be made of "unique" sustainable materials, the statement said. The Velar is the first Land Rover to use Jaguar Land Rover's D7A all-wheel/rear-wheel-drive platform that underpins the XE midsize sedan and F-Pace SUV sold by sister brand Jaguar, according to reports. It is expected to use JLR's new range of four-cylinder engines, including a 247-hp, 2.0-liter gasoline and a 237-hp, 2.0-liter diesel. Six-cylinder gasoline and diesel engines are also likely to be offered, dependent on the market. The model is critical to reviving parent company Jaguar Land Rover's profitability following recent years of rapid expansion since Indian carmaker Tata Motors bought the automaker from Ford Motor. The UK division's earnings for the nine months through December dropped 15 percent, and the return on sales narrowed, which the company blamed in part on a weaker product mix and higher marketing spending. Land Rover is fending off competition from other carmakers pushing into the burgeoning worldwide market for SUVs and crossovers, including the Bentayga from Volkswagen Group's ultraluxury Bentley nameplate and the Levante built by Maserati. The Range Rover brand's most recent model addition was the Evoque, its smallest vehicle, which was unveiled in mid-2010. The Velar has been speculated on for months in the auto press but Land Rover refused to confirm reports about it until Wednesday. The company said it will release further details on March 1 ahead of the SUV's debut at the Geneva auto show on March 7.